Lee Demarbe on Rue Morgue Radio. This week Rue Morgue Radio has the first in a series of 'rambunctious' interviews with Ottawa's own Lee Demarbe. I'll be anxious to hear this series! 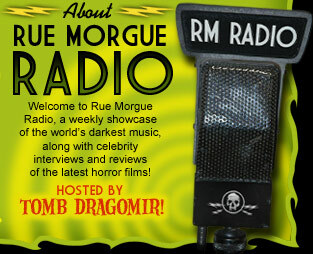 Rue Morgue Radio, for those of you who don't know is THE Horror podcast to subscribe to. So run, don't walk, and subscribe today. Oh ya... they're up for another Rondo award, so don't forget to vote for them here. Just listened to the second part of the interview yesterday. Hopefully there will be another round of Smash Cut as I missed it last time. Nice to see Ottawa on the RM radar!